My names Mike and I’ve been lucky enough to live in Hoi An for the past 2 months. It’s a great little place in the middle of Vietnam that I’ve fallen in love with. The culture is interesting and the food is delicious. But the main reason I enjoy living here is for the excellent cycling network. Once you leave the main roads you’re left with some of the most picturesque cycling you’re likely to come across. I had an image of Vietnam in my head before I came here and cycling across the rice fields on a late afternoon is almost exactly how I imagined it would be. The other day I cycled out to the Bamboo Village in the countryside and decided to take a few pictures along the way. I’ll be the first to admit my trusty steed is not quite up to the standard of bike that I’m used to riding. For a bike to fit you properly your leg should be straight at the bottom of the pedal stroke. Mine is almost still at a right angle! But although it’s like wearing a pair of shoes 2 sizes too small, I kinda like it! It comes with one gear, a basket for your shopping, a dynamo light and an all essential bicycle bell. I’ve been riding it for two months and other than a flat tire we seem to get on well with one another! What’s more is that it seems to be the only style of bike you can get around here. So it’s unlikely to go missing. Much like my classic “pub bike” I had back in England I’m perfectly happy leaving this beauty around town. Safe in the knowledge it’ll still be there when I get back! For the start of this ride, I was at a place called Dingo Deli. It’s one of the most popular places in town for the expat community. And it’s a great place to start from because it’s so close to the countryside. 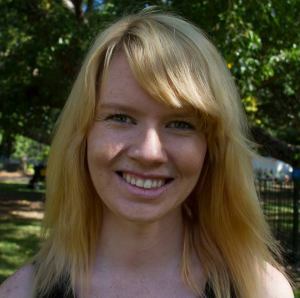 I’d arranged to meet one of my friends at around 3:30 pm in the afternoon. If you go anytime between 10 am and 3 pm your tires will melt to the tarmac and so will you. Those times are best spent inside some of the many restaurants and coffee shops nestled around the old town. Preferably the ones with aircon or really big fans! The road outside Dingo Deli is little busy but by taking a right just 1 minute down the road will take you to the pleasant countryside that I always imagine when thinking of Vietnam. The roads become just wide enough for two bikes passing one another and that’s it. Either side of you are the rice fields where you’ll find farmers working away. If you have something like maps.me you can plot out a route that’s almost entirely on these types of road! It’ll just be you and the occasional motorbike or cyclist. It’s a bit unusual for tourists to be seen on these roads so you’ll normally get a big hello and friendly wave as you roll past the locals. 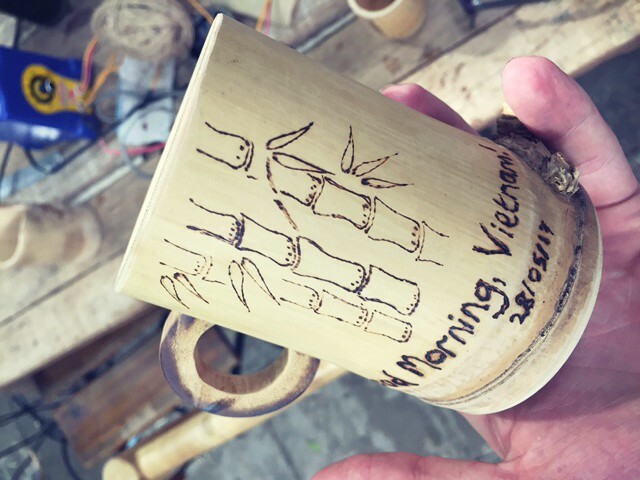 The Bamboo Village is a place where everything is made from, yup, you guessed it… bamboo! We went there to make some coffee cups (which make great gifts) but it was pretty cool to see some other the other stuff that had been made there. There were a car and even some bikes! After our visit to Bamboo Village coffee cups in hand, we saw a huge bridge connecting two islands. It’s quite a way to the top, made even harder by our squishy wheeled bicycles. But we pushed on making it to the top for a dramatic photo opportunity. While I was busy looking beautiful a few guys jumped in on the photo as well! So all in all a great day out was had. We’re in the middle of planning a longer cycling trip in the next couple of weeks. 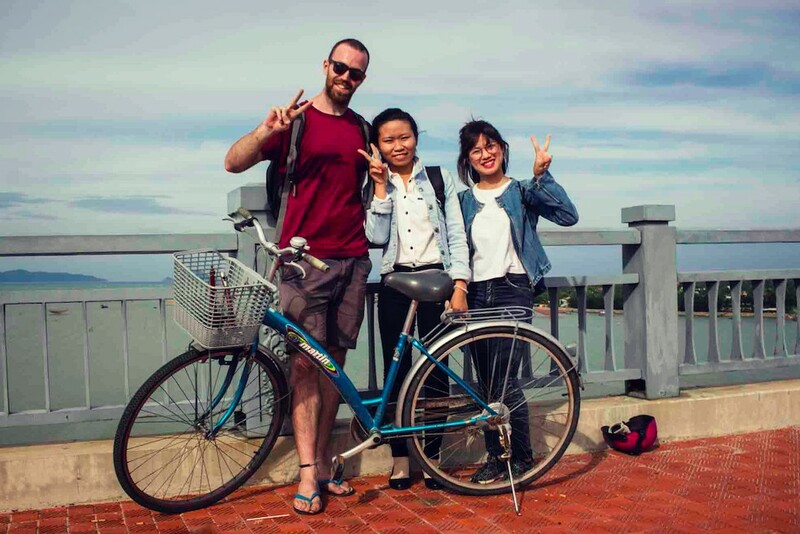 Recently I was able to take a motorbike trip from Hoi An to Hue, riding over the famous Hai Van Pass. We’re planning to do it again but this time on bicycles! As this trip will be a few days long and we’ll be camping out we’ll need to pack some sleeping gear and upgrade the bikes a little. Like most countries, the big cities can be a hectic to cycle in, but once you’re in the countryside I personally believe that you can’t this place. 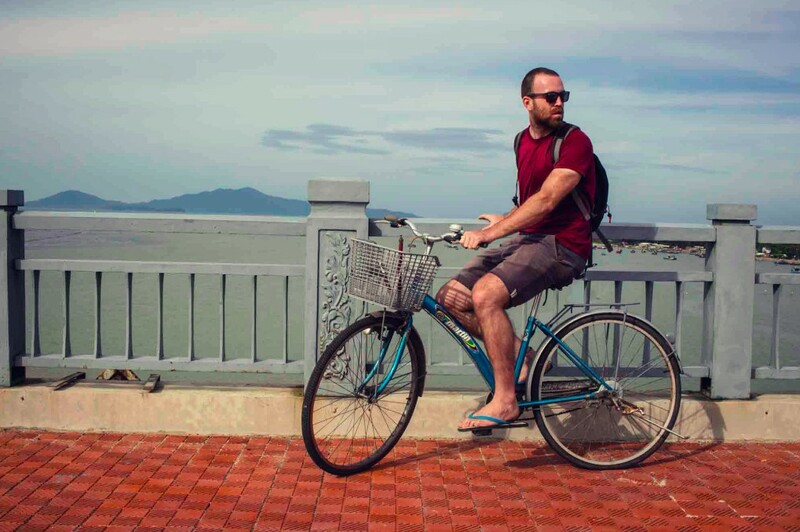 So if you ever find yourself in Vietnam get yourself a bike and get cycling! 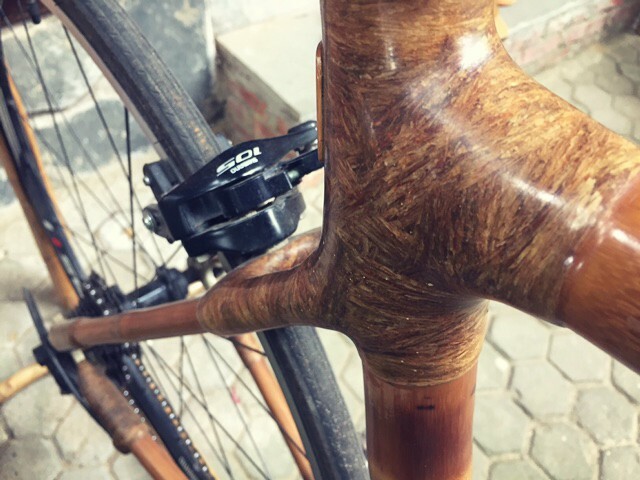 Mike McLeish is the owner of the bicycle blog Pinch-Flat. 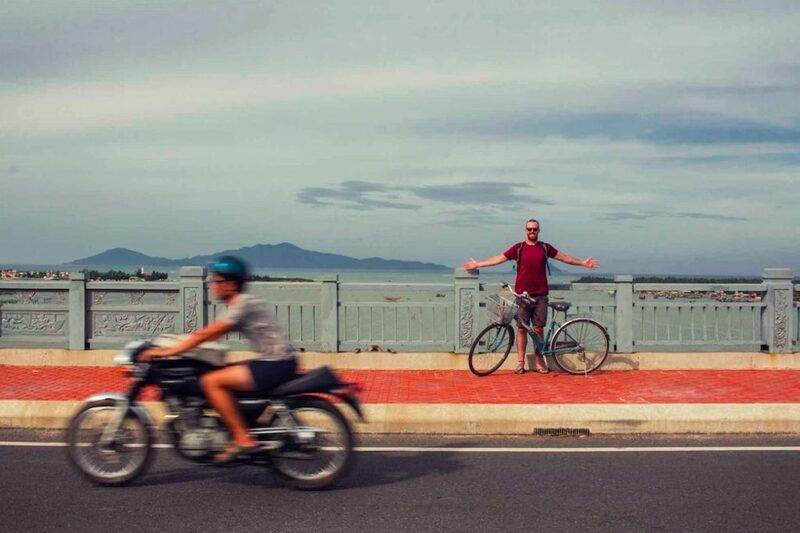 He’s currently taking full advantage of the warm weather in SE Asia, where you can find him weaving through traffic in Vietnam. Follow him on Twitter @Pinch_Flat. How amazing that he has been living in Vietnam. This is a place I have always wanted to visit. I have this picture in my head I so want to recreate in real life. I love the idea of cycling while there. Visiting those rice fields and the Bamboo Village described here. What a great day trip. I loved the write up. It reminded of my cycle ride from my college to a nearby Nalsarovar (a bird sanctuary in Gujarat, India) National Park. Started early morning and reached in the afternoon. Loved reading the blog post and loved the bamboo cycle even more! Thanks for sharing. I loved cycling in. Vietnam once my pulse got used to the crazy traffic. Traffic might head in one direction but there are always motorbikes going against the flow. It really meant you needed eyes in the back of your head. As with many things in Vietnam you just get used to it. HOi An is a dream! Wow! I love cycling, especially in SE Asia! I wish I had known about the bamboo village when I visited Hoi An two years ago. I’ll definitely make this a stop on my next trip ti Vietnam! I just came back from living in Vietnam for the past year and a half but never heard of this place! Will be making a master directory of things to do in Vietnam so this is a great resource post! 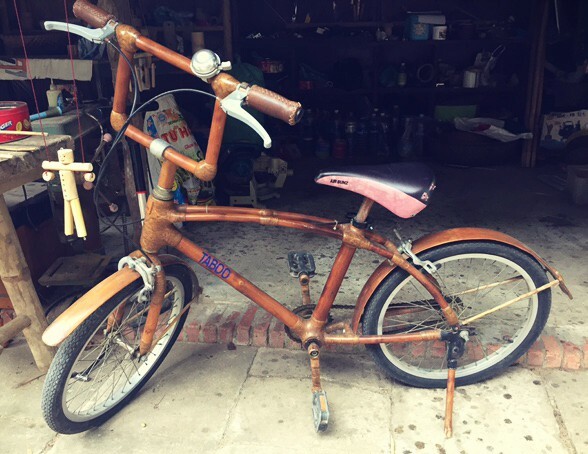 I love the bamboo bikes, rode one while I was in the Philippines! Riding a bicycle across a field is not how I imagined Vietnam. I actually imagine a very busy, hectic street with lots of motorcycles. And that is what I saw when I visited Vietnam. I would much rather have Mike’s experience. Do they customize the cups? I can’t tell if that is the date Mike got the cup made or the day they made it. This is a fresh perspective of Vietnam. Hoi An looks a really charming village. 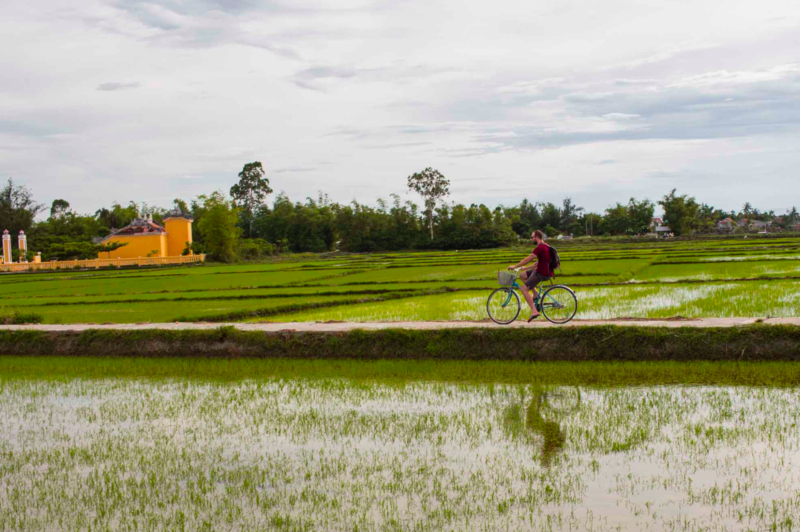 Cycling between rice fields and breathing in the fresh air must indeed be an invigorating experience. I am sure this is an experience you will be cherishing for a long, long time. Wow, the name of the village is truly unique and I have just heard about it. I like how they came up with the idea of owning a lot of bamboo products. I know that it is very rare to find a place like this and traipsing your feet to this village must be really an awesome experience. I haven’t been to Vietnam yet and I’ll surely include this. Thank you so much for sharing this with us.